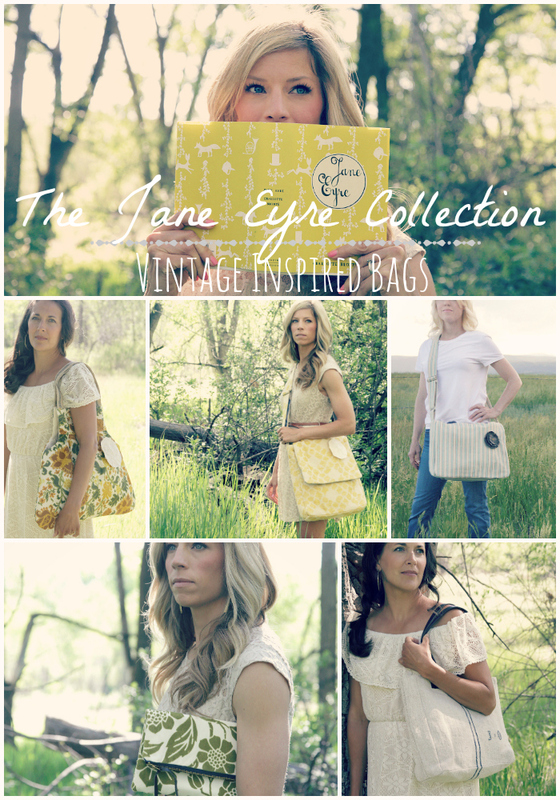 We launched the Jane Eyre Collection at 5pm MST on Saturday night and the response was amazing! Thank you for loving the new bags and jewelry and for selling out some bags so quickly. Our collections are about storytelling and the gathering of vintage fabrics, new fabrics, vintage buttons, embellishments and vintage findings for the jewelry is one of the beautiful and exciting parts about offering our two collections a year. I appreciate so much that we have customers that equally appreciate the attention to detail in each bag and the vintage elements that go into our collections. I am so excited that our brand new Matilda Art Bag sold out within only 1 1/2 hours! We will be bringing the art bag back next collection and making sure we have even more to offer next time. After seven years we still make bags because the response is so beautiful to them! We still have so many gorgeous jewelry pieces and we have a large supply of other bags so I hope you will come and take a peek at what we have been working on. I also love to do a giveaway each collection and this one is no different. *We are going to also offer the online course package to the friend of your choice so you can be creative together! This is over $1,000 in giveaway items! To enter all you have to do is leave a comment on THIS post letting us know what piece you love from this collection. Each time you share about the sale or this post please come back and let us know. I lover them all, but probably the art bag. I would be so proud to carry my art supplies in a bag that beautiful! The purse I bought before, gray ruffles, is still my favorite purse, and always get compliment s. Thank you for this generous opportunity. Xo all extremities crossed! I also shared on Facebook for a second chance. Love your designs!! My wish list is the large feed sack handbag! Your collection is so pretty practical and one of a kind, I’m a real bag lady at heart , I love all of the bags big and small!!! I tweeted this great giveaway. https://twitter.com/PamBallard1/status/491248488361893890 Thanks for the chance. Congratulations on the success of your wonderful collection! I LOVE the grain sack market totes and the necklaces too 🙂 Thanks so much for the chance to enter this generous giveaway! Shared on pinterest also. Thanks for the chance. http://www.pinterest.com/pin/86835099040276845/ oops heres the link. Oh the Josie camera bag! Love it!! I love your creatively made jewelry and LOVE your market bags! Really……I love everything! Ooooh, I adore the Josie Camera Bag!!! Love your new line! So very pretty and definitely you! What a wondrful collection. 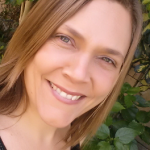 I would love to have the chance to win your online-courses. I have bought two already and loved them! Love all the jewelry! Liked on Facebook, pinned and twitter! 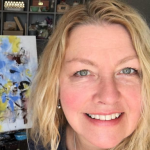 OhMyGoodness I would SO LOVE to win your online classes…I have been studying everything offered on your blog so far and have signed up for your art class in Santa Ana next month…but there’s so much more I would love to learn from you. Thank you for your inspiration and for your generosity with this contest! Oh my, I love the whole collection but especially the art bag! 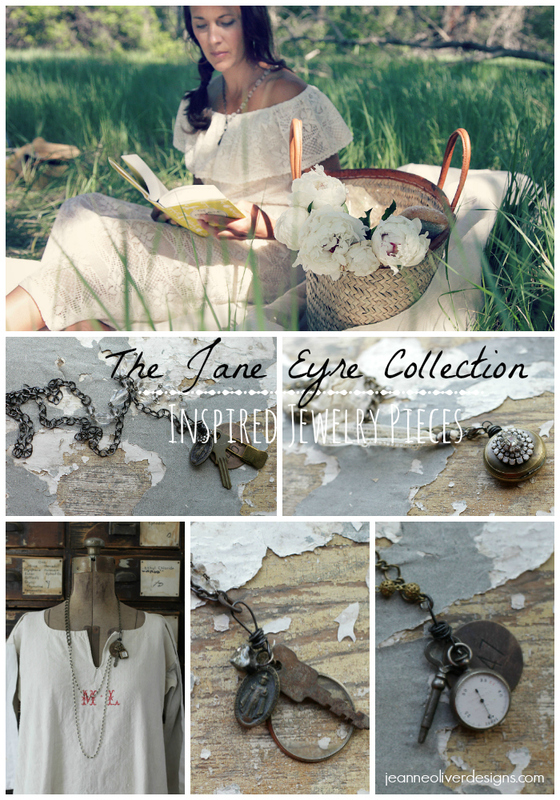 Another thing I love about the collection is the name “Jane Eyre Collection”. You have a wonderful talent for picking the perfect names for your collections, Jeanne. Now I want to pack the bag with art supplies and a book and head for the nearest meadow! I’m in need of a camera bag, so I’d have to say the Josie bag. I love it all, but probably the jewelry line is my favorite! Jeanne- LOVE this collection! The Josie Camera bag- swoon! xo Well done- love your creative soul. What a super generous giveaway!! I am in love with all of your handbags, but I think I love the Matilda the best! Thank you so much for the chance to win!! Best if luck with your new line! All of the bags are beautiful – the art bag is my favorite! The jewelry is gorgeous!! Thanks for the chance to win! I absolutely love the Emerson handbag. But to tell the truth its hard to pick just one. I love everything, it’s all beautiful! But, especially the Luella Vintage Clutch. SO cute! I also pinned this post on Pinterest. 🙂 Thanks for the opportunity! Wow, I LOVE the art bag. What a great bag to use for art on the go! Thank you for your most generous offer! What a fun giveaway! Thank you! I LOVE all of the bags and the vintage jewelry. The photos are great…and what a clever way to display them! My favorite piece is the Lucille Neclace. Love!!! I’ve liked this on Facebook as well. i’m loving the art bag! your collection is distinct and beautiful! like you:) thanks for this chance to win …. Ooh, either the art bag, camera bag or roll-up brush carrier would be so inspiring! What a lovely, lovely giveaway. Your pieces, bags and courses are all so amazing. I love the grace necklace and all your grain sack bags. I also love the Katie clutch. I love the collection. The bags and jewerly are awesome. I would love the online classes. Hello, really, everything here is so beautiful. I would love to take one of your online classes. I pinned to my Beauty board on Pinterest. . .
Art bag is fabulous!! Beautiful job, Jeanne! Mine would have to be the art bag since I go to my bff’s once or twice a week to do art with her and I carry most of my supplies abck and forth! All are lovely items! The Josie camera bag, and of course the most beautiful art bag. The vintage jewelry is stunning and I just adore the Grain Sack handbag as well. I love it all and can’t thank you enough for the chance to win this amazing giveaway. Love the necklace with the key and magnifying glass. Although everything is lovely. Thank you for this chance! I LOVE the art bag (with every bit of my breath). I know that sounds silly. I care? Nope. Just shared on FB, Pinterest, LIKED, etc. I think I LOVE giveaways! Love the collection! My very favorite is the Luella clutch. Everything is so beautiful!! I can understand why the art bag sold out so quickly – it is gorgeous and my favorite! Thank you for the chance to win! Love it all! but if I could only have one item it would be the vintage clutch. It reminds me of my grandmother, she was so stylish. She always looked perfect, even when working and she was an antique dealer & refinished furniture for a living, she got dirty. I’ve pinned it, shared it on facebook and retweeted it twitter. I pinned the give away! Thanks for the chance! Just a gorgeous collection! FB, Pinterest and Liked! THANK YOU! This collection is just stunning…I love the jewelry (as I always do!) so much! Here is my favorite piece from the collection. Please do not stop designing…Your vision is amazing! Love the collection! I’ve long wanted a camera bag – would love to win it or any of your wonderful products or courses! think it would be awesome to win the classes and share them with a new art friend that i’ve been graced with! It is SO hard to pick just one, but I would have to say The Matilda, love the beautiful yellow print and I would make great use of that bag. I have really enjoyed your art courses. Jeanne you are so easy to listen to, and learn from. Thank you. I love them all and would be happy with any of them. I especially like the art bag. Posting to blog for second chance. Oh Miss Jeanne you know I adore everything you do!! I love the market bags! This collection is so beautiful that I can’t pick just one, you always do such an amazing job with every collection. Looking forward to the next collection as well. Thanks so much for a chance to win. I would love any of your bags, but would love to win the art bag. Pinned and shared! The grain sack market bag hands down!! I need a big pretty bag for all my art supplies I drag back and forth to the studio! What a beautiful collection, love them all! The Josie bag is my favorite!!! Thanks so much for the chance! I Pinned the Blog on my pintrest page under Things I love. I love the Art bag and the green floral bag. So much to love, but the camera bag is my fave! ohhhhhhh everything looks so lovely…my favorite is the Matilda art bag, love it!! Matilda. Matilda. Matilda. WHERE have you been all my life? Everything here is simply stunning and I have a difficult time choosing, but I really think The Matilda is my all-time fave. Thank you so much. Love, love, love the Josie Camera Bag! I adore the jewelry! And the bags are lovely. Thank you! And thanks, too, for the online courses. Totally love the green print clutch in the Jane Eyre collection. Such a beautiful collection, but I would have to say my faves are the Grainsack Market totes. I have a small obession with grainsack so those in particular speak to me. 🙂 The jewelry is also quite stunning! Simply spectacular Jeanne! So many choices….. but I would love the Luella Vintage Clutch!! OH my Gosh! You want me to choose?!?!? Just one??? Mmmh… uhmmm…. Ok I’ll go with the Joise camera bag. But wait, I really, really like the Art bag too. And then there’s the Vintage Grain Sack Handbags. Oh my. What’s a girl to do but like them all. Heehee. Oh my goodness, I love it all!! 🙂 I would say it’s a tie between the camera bag and the vintage clutch for my favorite pieces!! I love the Emerson bag! Thank you for this opportunity to win something beautiful! Wow! I LOVE the Josie bag for sure. Wonderful collections, so hard to choose a favourite! If I had to I would pick the Matilda art bag too! And the necklaces are amazing! I love the camera bag and the jewelry and the grainsack bags and the online courses and…well, you get my drift! Thanks for the chance to win. Shared and tagged on Instagram! I LOVE THE GRACE NECKLACE! SO MUCH THAT I HAVE TO SHOUT ABOUT IT!!! IT IS ART DECO MEETS MODERN, FRED MEETS GINGER, LUCY MEETS RICKY, CHARLIE BROWN MEETS SNOOPY, AND JANE EYRE MEETS MR. ROCHESTER!! Anxiously awaiting the arrival of the necklace I ordered, but would love to win a beautiful bag too! Sharing on FB..Thanks!! Love the Josie Camera Bag! Love them all but if I had to pick one it would be the Emerson! Downright beautiful giveaway chance!! Love each and everyone! :) Thank you! I LOVE the grain sack tote that I ordered and I can’t wait for it to arrive! i love the collection, my favorite is the Grain sack market bag, cinq, it is beautiful. Would love to have one. i shared on pinterest. Hi what a lovely collection. I am thrilled to get your email with the name The Jane Eyre collection… as I was watching the movie Definitely Maybe just last night where the girl is searching for her lost copy with an inscription from her father…etc… Cool! I love the Matilda art bag. I have pinned the link (if that’s how you say it!?!?) Thank you for your inspiration Good luck with your collection. I love the clutches…I think Luella is my favorite but both are gorgeous. Love the new collection! Your designs are always incredible! Entering your wonderful giveaway. Just shared on Facebook. How fun to win the workshops or the camera bag. Thank you for the chance. You create wonderful things indeed. I posted a pic of the grain sack tote on Instagram! Your new collection of products are gorgeous. And the photos that show them off are beautiful. Nicely done, Jeanne and staff!! I LOVE the vintage grain sacs…. The art bag is a fantastic idea~ Love that too. For the amazing opportunity to win. Just blogged about this great giveaway! Love the jewelry, keys and clocks are my favorite for necklaces! The whole collection is lovely, but the art bag is one of my favourites! The Josie Camera Bag is my favorite and on my wish list! As is true of everyone else, I would be delighted to win. Just saw the new collection and all I have to say is, “be still my beating heart.” I am in love! Your designs always inspire me and bring happiness and joy to ordinary life, a real talent you have. My fave would have to be…..the Emerson. That bag is everything that I love being a girl. Feminine, smart, delicate and just beautiful. I Pinned & Tweeted too! <3 Love love love. The entire collection is wonderful! I’m torn between the clocks and the art bag, both beyond lovely! I love the Margaret necklace! I love the Jane handbag…and so many other things….such a lovely collection! What a giveaway – wow ! I have to admit I love the art bag! I also love the brush holder too (it is a close one) – I should not have hesitated when I was looking at the new line on Saturday and drooling… the best part of the giveaway is all the classes – that would be sooooo exciting to win! Hi. Everything is beautiful but I definitely have a favorite. The “Art Deco Prints” are gorgeous. Thank you for the giveaway and I wish everyone good luck. I’ll be posting this on my facebook page. 🙂 I’ve also pinned it on pinterest on “Things I love”. I love the grain sack bags! I liked it in FB! I’m so sorry not to have clued into this sooner! I love the Art bag but alas you are out! I love the Camera Bag as well. And the Annie and Elsie necklaces. Basically I love all of what you have here! And please, let us not forget the classes! Would love that as an option as well!! Best and congrats to you, Jeannie! The flower print bags are beautiful! I’d love any of the jewellery and that art bag is amazing! This is so exciting! All your purses are wonderful,but I would have to pick the clutch style.Both the Katie and Luella are beautiful, love the fabric on all the bags. Everything is so beautiful but for me the choice is easy.I would love to win the online workshops, both for myself but also so I could share with a friend also on a fixed income like me.A gift that would keep on giving. Gorgeous collection Jeanne ~ each piece is stunning. I LOVE the Matilda art bag, a beautiful way to keep sketch book, pens & pencils safe while on the go. Perfect accessory to take on holidays! 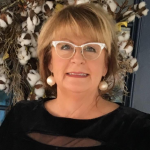 I pinned too…I’m Cynthia Byers-Schield. I love the Josie camera bag. I would probably carry my camera in one pocket and stick my watercolor box and a small watercolor pad in the other. Such cuteness! I love it all! Everything is so beautiful!!! How to pick just one? Love the bags as well as the brush roll!!!! I love the Luella Vintage Clutch. The fabric looks so soft and bright. What a beautiful give away! Congratulations on all your success! Makes me feel I can reach for my dream, too! The paint brush roll up is such a lovely piece. And classes. Wow, Thank you for a chance to win . So much gorgeousness! I would love a necklace from the vintage line. 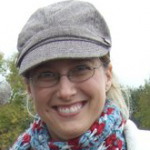 I am most excited about the chance to win the online course package! What an awesome opportunity. Thank you for offering this! Jeanne, this is all so beauitful! Love the Luella clutch! Best of luck on the new season. I love the art bag but it is so hard to pick a favorite! Everything is so beautiful and unique!!! I love the camera bag the Josie but I really love them all! Just beautiful!! I ? both the Josie camera bag and the Matilda art bag. The fabrics are beautiful and I love the removable flower pins. It would be fun if there were additional leather or fabric flower pins available for purchase in other color options to change up the look of the bags when you feel like something different. Oops! The “?” in my comment was supposed to be a HEART as in “I LOVE both the Josie camera bag and the Matilda art bag.” I guess that symbol doesn’t translate in the comment section. I love the Margaret and Lillian necklaces!! Oh I would love the Josie Camera Bag! This is a lovely romantic collection! I love to learn something everyday as I did not know you sold items..love the bags, jewelry–maybe everything!! My mother’s name was Betty, so I like the Betty necklace best. I always enjoy seeing the new ways you show your collections. Awesome job! Thank you for the giveaway! So generous of you! Thanks for having a giveaway. I love the Vintage Grain Sack Handbag – Trois! I, too, love all your products!! I especially love the jewelry and the Matilda Art bag. I’ve pinned this post, too 🙂 Thank you for daring to share your heart to the world—that’s the most special thing of all! I would love to win the package of classes. Such a great opportunity. I would love to take all the on line courses. Thank you. Beautiful collection! Need and love the Art Bag. Jewelry pieces are gorgeous. Oh my Goosh I love them all. The art bags and the Jewelry are my favorit. Thank you for your most generous offer! I love the Josie Camera bag and the Matilda Art bag (already gone but I still love it)!! Thanks for the giveaway. Pam M.
Posting of FB … for ‘another’ entry:))). I love all those bags – especially the Matilda. Not surprised it sold out! Sharing on Instagram too! Sorry, not a tweeter or blogger. While I love all the bags, especially the market sack bags, my favorite is the Matilda Art Bag! Thank you! I would love the complete online courses and the all of the bags and jewelry are gorgeous, so it’s such an awesome giveaway! Pinned, Tweeted, and Facebooked this as well! I love the jewelry line. Posted about the collection on Facebook too! I love the Matilda Art Bag. Gorgeous & functional — that’s the best! I love everything too! I think my favorited are the art prints and the jewellery. 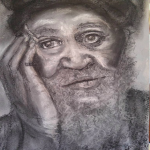 I’ve taken a few online art classes and I love them too! I love the grain sack purses! Especially with blue ticking tucked inside! I love all of the bags in the collection, but my favourite would have to be the camera bag. I dropped my DSLR camera last week whilst out photographing resource material for my next textile art projects. It is irrepairable, so I have to save up quickly for a new one. Not only would a Jayne Eyre camera bag look stylish, pretty and feminine, but it should protect my next camera and keep it safe! So pleased the Collection is such a success. Congratulations. I would love any item from the jewelry collection!! They are lovely!! Posted the link on Facebook. This is a lovely colleciton. I adore the green clutch! What I meant to say is that I LOVE the paintbrush holder! Everything is beautiful but my favorite is the art bag. I would love to win an online class as well! Thank you for being so generous! I love all of the goodies! The Luella clutch is adorable. The art deco photo collection looks wonderful! What an inspiring collection! I would love the Josie camera bag for my snazzy camera! The grain sack market bag is gorgeous! What a lovely collection! Pinned and Facebooked! Love the collection and would love to win! I love the Lucille necklace! That is just beautiful! Hello!! This is amazing as are all your collections! I would love to win the camera bag for my daughter who is a photographer, video maker and multi media working young adult. As a vintage jewelry designer I just LOVE your jewelry collections and of course all that you do. Your creativity and insight is inspiring. I have tweeted, pinned, facebooked and instagramed! Thank you! Jane Eyre…my favorite book since i was a little girl, (still have that first copy i read then, and i re-read it again a couple of months ago). i’ve loved every film adaptation. What a lovely generous giveaway! no way i could pass this one by. So so beautiful! The Luella clutch is beautiful! I’d feel like a real photographer with the camera bag…perfect for Italy!! and, of course, the online courses (for me and my daughter, both crafters at heart). Pinned! The entire collection is amazing. Love the jewelry line! exquisite, beautifully made. All things Jane Eyre, posted on Facebook to share with my friends. Thank you. I love the whole collection, especially the Luella clutch. What beautiful creations! I love all of your lovely bags, especially the market bags. Sharing on FB too. I love the art bag! As usual everything is amazing Jeanne! I have to say the camera or art bag are my favs! Totally love all the jewelry pieces! I love, love the Emerson Handbag! Everything in the collection is so gorgeous and new to me. So happy to have found you. Pinned!! Pinned This! So much love! I love the necklaces and the art brush holder. Beautiful beautiful!! Love the Jane Handbag with the blue flowers, my color. Also, The Vintage Grainsack Deux Handbag. Thanks for the opportunity for this great give-away. I can see why the Art bag sold out so fast, it would be perfect for art on the go, and classes. I love them all, but I think my favorite is the Emerson…so stinkin cute! The Mathilda Aort Bag is beautiful. I look forward to seeing your next release of it as I wasn’t quick enough to get the one from this collection. You always make such beautiful things!! Love them all. Love the Matilda bag. Love it all. OH my the Josie Camera bag is delish…but I love all your yummy stuff!!!! THANK you for the chance to win any of the amazing things. Floral purse. I love my camera bag I bought a few years back from you and the class as well. You are wonderful. Thanks for the chance to win! Many blessings! Wow, so generous, thank you for the chance! Beautiful stuff as always! 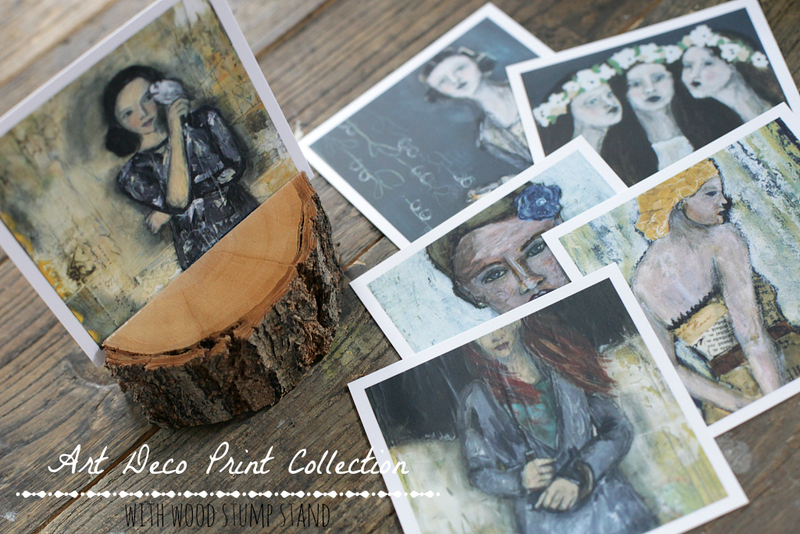 I love the art stump and prints, as well as the Elsie necklace! Great giveaway from you. I would probably pick the necklace. Just posted this to Instagram #jeanneoliverdesigns on heathhaven! I can already see the Matilda bag packed for my weekend cabin trips.. These fabrics are absolutely gorgeous and certainly a work of joy! I love each and every one of them. I would especially love to share a class with a friend! That would be a real “work of art”. Thank you for such a generous giveaway(s). I love it all but the bags are wonderful! Just shared on Pinterest under “Styles I Love!! !” Love your style and creativeness, would enjoy any gift and any opportunity to learn!! I love the art bag. Perfection. I don’t usually wear jewelry, but I especially loved your jewelry pieces. What a generous giveaway and a beautiful collection! Love it all, especially the camera bag! I love and NEED the camera bag! I’ve wanted this for a long time! Congrats on new line, love the jewelry as well! Love this collection! Love the bags the most – so much can’t make a decision on which is best. Matilda, vintage bags, all beautiful! I also pinned to my boards! The white clothing is scrumptious and the jewelry makes me swoon! The whole collection is so nicely done!! Please enter me in the giveaway because I’d be over-the-top to be picked!!! Love them all! How beautiful! So hard to choose just one! Probably the Josie camera bags. I love them all…but what ia my favourite! It would have to be the Josie camera bag, and I am so thinking about the Luella clutch…all so beautiful? I love all the bags and jewelry but I think I would like the online classes. I love online classes and I learn so many new ideas from them. I would also be more than happy with any of these beautiful items. I love the art bag!!! It looks so roomy you can carry everything you need in it which is wonderful. I have always wanted a bag like this. Beautiful collection! Love the grain sack bag and the key jewelry. I love everything! And I’m bummed I missed the gorgeous grainsack bags—– that will teach me to be faster next time! Thanks for the opportunity I’m giddy with excitement Jeanne! I love the Annie necklace and the camera bag. The camera bag would be perfect for traveling. My favorite from the Jane Eyre collection is the Matilda Art Bag. This art bag is simply brilliant! The details that are included are impressive. From fabric dividers to pockets designed to hold just the right necessities for every artist. And if the design isn’t amazing enough, a Jo Roll paint brush holder and sweet cream flower are added to accessorize the bag with style. Also, the bag is made with beautiful vintage fabric and an antique magnetic brass snap. Jane Eyre would be honored to be using such a wonderful bag as she creates art on the moors, as well as, having such an exquisite bag be part of a collection named for her. What a beautiful collection! 🙂 the sold out art bag is delicious <3. I also love the Martha and Evelyn necklaces and the Josie Camera bag? thinking computer bag maybe? I love the art bag, it’s roomy enough for all my art supplies! Oh sweet goodness… I adore the Josie camera bag!! You are A-mazing, thanks for the awesome chance!! I love the art bag! But all are special and beautiful! Hands down the Luella clutch. Dar.ling. I posted about the collection & giveaway on Facebook too. So many beautiful items. I like the Vintage Grain Sack Handbag Un. The Matilda is beyond awesome!!!! Beautiful new line. Love the new jewelry! I love them all! The necklace or camera bag would be awesome or the online classes would be great too! I love the Lillian Necklace. So romantic! Thank you! It’s all gorgeous, but the vintage clutch really caught my eye (since you asked to pick just one)! ohh… i love the matilda art bag! such a beautiful collection! Congratulations you are such a positive person which comes through whatever you do! I really love the Jane bag as well as the Emerson bag. Thank you for the giveaway, I love your stuff! Loved the looks of the art bag… will have to wait for a future release! 🙂 Nice collection. LOVE< LOVE<LOVE your new collection!!! I LOVe vintage things and you rocked it this time and always!!! Thank you for your amazing staff and talent!!! Whoa! So glad Kolein pinned this page! Gorgeous stuff. I first listened to Jane Eyre when I was driving from New York to Arizona. I think my favorite piece of this collection is the Josie Camera Bag. Something about the beautiful stripes with the hint of gothic leather flower. I could actually picture a modern-day Jane Eyre carrying it about. Pinned, Facebook posted, Tweeted: spreading the love to all the Jane Eyre fans I know. I love the whole collection, but especially the market bags.. Thanks for the chance to win..
Ooh! I would LOVE the Josie camera bag! It’s beautiful! I’m so excited to see your new collection!! I also tweeted about your new collection! 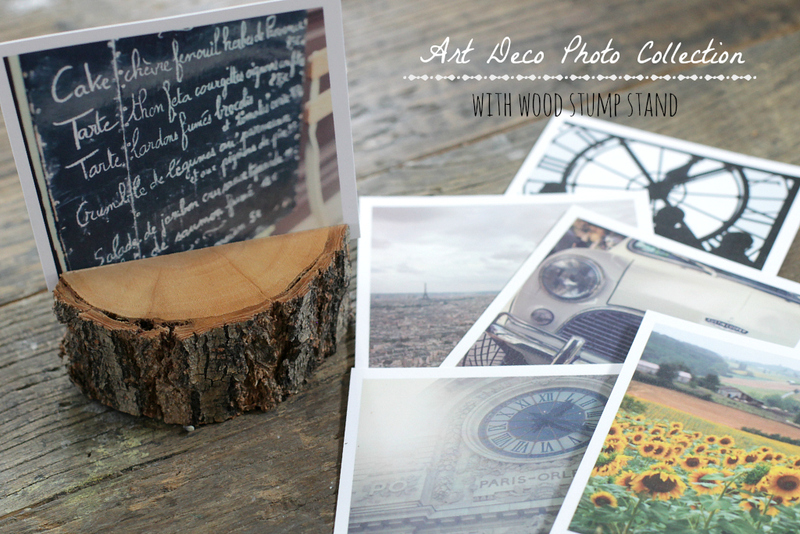 I am in love with all of it, especially the Art Deco Photo Collection With Wood Stump. I’m not sure what the wood stump is all about, but I love old photos. I am hoping this collection is a success for you. I am posting this to both Facebook & Pinterest. I love it all but the bags are beautiful along with the necklaces! I would feel so beautiful with all of these!!! The Josie Camera Bag would be my pick, love it! I LOVE the Vintage Grain Sack Handbag Quatre and the Un.. so pretty! Gotta say though that I loved the Josie Camera Bag just as much. Not sure I signed up using a profile you could find me on Jeanne at my comment above.. so here it is again (Vintage Grain Sack Handbag Quatre and the Un are what I love! Josie Handbag too! I love all of it…the grain sack bags really speak to me though. Just shared on facebook. Thanks for the chance to enter! What a nice giveaway! I adore the Josie bag .. I tweeted about your designs and giveaway here: https://twitter.com/LeeAnnGarrett/status/491389475973783552 and retweeted your tweet about the giveaway here: https://twitter.com/jeanneoli/status/491250347282014208. I’m so glad I went ahead with my order of the Emerson bag. I love it and can’t wait until it arrives and I can use it. Thanks to your seamstresses for all their hard work. I know how much time, creativity and love go into creating these. I pinned on my Style Board! I love LOVE love the art bag!! Such a wonderful giveaway! Your bags are beautiful. OMg they are all so awesome, the bags, especially the Art Bag, no wonder it sold out so fast. I am in love with the Emerson bag. It really should be on my arm 😉 Beautiful things! I love the Josie camera bag!! I love it all but the items I really LOVED are all gone (from the jewelry collection and the Matilda art bag). What a beautiful collection! And, what a generous give-away! Thank for adding such beauty to this world…that are ALL stunning! Thank you for offering this giveaway! I would Love to take the classes!!!!!!!!!!!!!!!!!! Thanks Jeanne Oliver for the giveaway! Shared on Facebook. I really REALLY love The Lillian Necklace! What an exciting giveaway! Love your bags and jewelry collection! I love it all, but everything french grain sack makes me swoon. What a generous giveaway! The Josie Camera Bag…they are all great. I’m totally drawn to the jewelry! Thanks for the chance to win! I like the Vintage Grain Sack Bag and the Art Bag. I pinned this to my Art & Vintage board. Just shared your blog on Facebook! Glad to do it. I love your freshness, Jeanne! What an amazing giveaway! Love it all! I love the art prints and the art bag. The jewelry is beautiful. It’s all so generous and beautiful! I’d be overjoyed to win this awesome giveaway! Thank you for the chance. ????? I pinned it! The art bag would hold a lot. The linen over-the-shoulder bags are nice and big too. I love all the necklaces. I love EVERYTHING!!! But…if I had to choose just one….the Emerson bag is adorable! I pinned this dreamy Giveaway!! So inspiring, I love to read the stories that you have created. My favorites in your collection are the vintage grain sack purses, I swoon most over those with the leather handles. I’ve so enjoyed your recent course on a Creatively Made Business 2.0. Thank you! I adore the roomy art bag!! I shared your superbly, fabulous, over the top giveaway on Facebook. Love your collection – if I had to pick a favorite it would be your art bag. Thanks for this awesome giveaway – I shared on pinterest at http://www.pinterest.com/pin/473863192016024161/. I love it all…what a fabulous collection. The camera bag and that jewelry have my special attention. Absolutely in love with the Matilda art bag! Shared this exquisite giveaway on Facebook! 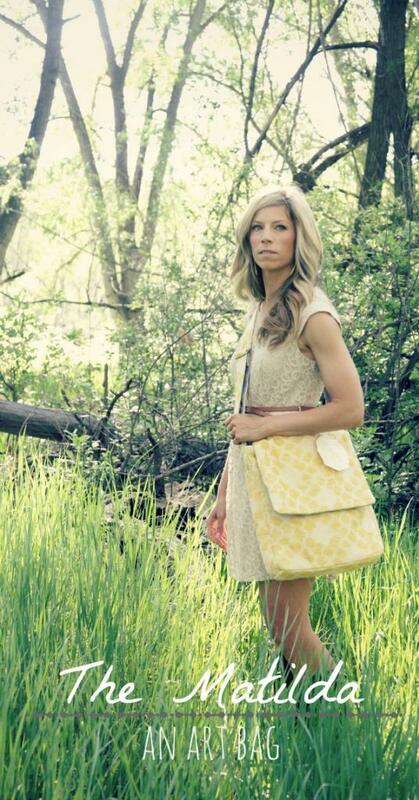 I love, love, love the Josie Camera bag! i just love your work, style and am inspired by your your work as an artist. I enjoy your classes and want to take more. My hope is to some day soon be able to get more time so I can create art and share with others the way you do. I love many of your items but I adore the Matilda bag. I think the grain sack market bag is very cute also. Keep up the beautiful work in so many ways that you do. Blessing. Congratulations on such a lovely collection! I am smitten with the Matilda art bag, the clutch and all of the jewelry pieces – all so beautiful! Thanks for your generosity in the giveaways – and the chance to win!! Love your classes and that sweet Josie bag I ordered! Want the art bag badly. Love–I posted on my fb page! Absolutely live the entire collection. The photographs are divine. My favorite is the art bag. Love the inside organization and the oursidd look. And last but not least … liked on Facebook. Wow this is a beautiful collection. I love the Luella clutch the minute I saw it!!! So hard to pick just one as I love it all. Love the jewelry and the art bag. Congrats on such a gorgeous line. Thanks for the chance to win something. I could definitely use a boost of happiness. The Emerson bag makes me so happy I can hardly stand it — I’m so bummed it’s sold out already! But the entire collection is absolutely gorgeous. Love everything, especially the Matilda bag! The Martha necklace is lovely! I love the Luella Vintage Clutch! Love the art bag! Portable mini studio! Yes, please! I travel a bit, so love having a bag of art-to-go supplies. Makes me happy! The products are terrific, but I personally LOVE your classes best of all! Oh my stars…the Matilda bag is beautiful! I LOVE, LOVE, LOVE the Grain Sack Market Bag. Thanks so much for the amazing giveaway and a chance to win something wonderful! Oh the Josie bag! A camera bag that you can take on vacation without it screaming, come steal my big camera! Wow your collection is smashing! I love so many of them but being an artist I would love the roll up brush case and or the artist bag. I love the Lucille and Betty necklaces. The whole collection is lovely. Thanks! I adore your jewelry, but would be completely in awe of winning the courses. 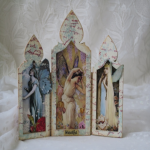 Have happily blogged about this fantastic giveaway…www.MRS Designs.LLC. What an awesome prize package! I would love love love it! Love it all, I especially like the Vintage Grain Sack Handbag, gorgeous!! i have shared your giveaway on Pinterest! Officially also bragged about your giveaway on instagram!! Love your classes and how much you share in them, and my favorite bag would be the camera bag! Thank you for such a great giveaway, any of the prizes would be great!!!!!!!!!!!! I hope I get picked, thanks again! I love the vintage clutch! It is fabulous! I love the Josie camera bag! Really beautiful collection! Would love to win any and all but the vintage jewelry definitely caught my attention… so gorgeous! I love everything, but especially the Josie camera bag. I also pinned this to Pinterest. I adore it all, but your new Matilda really caught my eye. Thanks for making such a wonderful collection… it’s all so beautiful. I love this collection. The Matilda bag is probably my favorite, and the jewelry is beautiful. Love the collection – the art bag has a special appeal. I really love the jewelry but everything is so pretty! Somebody is going to be very lucky to win! I love all your pieces but the Elise necklace is stunning . You are a gifted artist. I love your bags and jewelry. The art bag is one of my favorites but the necklaces are out of this world! Oh my… How to choose just one!?! I would just about die to take a class with you! 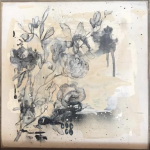 I also absolutely LOVE the gorgeous jewelry and the tree stump with interchanging photographs – I can just see this on my living room coffee table! Thanks for all the ways you inspire me to live more creatively! Pinned and posted to Fbook! Your collection is amazing – the bags are incredible! What an incredible giveaway! So hard to pick one favorite thing, but I love the vintage grain sack handbags! I love the Emerson handbag 🙂 So beautiful! I love the Josie Camera Bag!!! It would be perfect, because I have been using the usual unstylish black square camera bag… I just love this one! Thank you for the opportunity to win one! these are all so wonderful! I can see why you sold out so fast. Congratulations! I create art most days, so I would love the art bag. But they are each dreamy wonderful. Oh Jeanne – It is all gorgeous – as usual!! I love the Grain sack market bag un -gorgeous!! Did another mention of this giveaway going on your blog on instagram. PAMBALLARD (username). So excited for this. I love the market bags too! You did an amazing job with the product shoot. Love it all. I shared on Pinterest. Love the art bag. I also put on Facebook. Incredible collection. Love all your beautiful bags!! Would love any one of them!!!! Love the jewelry and the art bag! I love all of your bags, but the art bag is delicious! I LOVE the Matilda Art Bag!!! I am a HUGE fan of your blog and always wait in anticipation of your new line each season. I own several of your JO originals and get compliments everywhere I go. I always carry one of your cards and refer ladies to your site. I would love to win anything form your current line and of course your handbags and camera/art bags are my absolute faves! I shared on Instagram,twitter, facebook and pinterest! Good Luck to everyone and thanks for creating these wonderful one of a kind lines for those of us who love handmade! The art bag is great! (Too bad it’s sold out…maybe next time)!! Hi! I pinned you to my Pinterest Style board! Yay! I would like very much to participate and create in your online Masters class. Wowee! My favorite is the Matilda art bag; I love the pockets in it, and that it is a cross-over. Your Jane Eyre Collection is lovely. Thank you for offering the giveaway. WOW I really love them all! I do love the Camera bag!!! Thanks for this awesome give a way!!! Everything I’ve ever ordered from Jeanne I’ve been thrilled with. The new artist bag looks fabulous. Everything is gorgeous! I’m especially smitten with the necklaces! Pinned and would love, love, love to win! Everything is so pretty and unique. I think my favorite would be the art bag to carry my art supplies in. Too cute. Oh gosh…all so wonderful! I’d love the art bag although sold out or the Betty necklace or pretty much anything!